Summer is for salads. Between the multitude of fresh vegetable options and the summer heat, salads often become my top choice for lunch or dinner. The only problem is salads can be boring. If you are like me, too frequently you find yourself putting together the same old combinations of vegetables and topping the salad with your standby dressing. 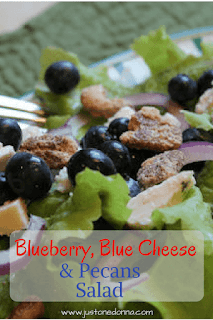 Today's blueberry salad is anything but boring. Not one little bit boring! The first bite offers the surprise of sweet blueberries bursting in your mouth. Then comes the wow from the sharp, blue cheese. Finally, you are rewarded by the sweet crunch of the sugared pecans. With each mouthful of this salad, you are treated to a celebration of flavors that will keep you coming back bite after bite. Make the sugared pecans ahead of time. Preheat your oven to 250 degrees F. In a small bowl, mix together 2/3 cup of granulated sugar, 1/2 teaspoon cinnamon, and 1/2 teaspoon salt. Set aside. In a separate bowl whisk together 1 egg white and 1 tablespoon of water until frothy. Pour 1 pound of pecan halves into the egg white mixture, stirring to coat. Remove the pecan halves from the egg white mixture with a fork into the bowl with the sugar mixture. Using two forks, toss the pecans until well coated with the sugar mixture. Spread the pecans onto a parchment lined baking sheet, making sure they are spread out well. Clumps will stick together. Bake for about 1 hour, stirring the pecans every 15 to 20 minutes. Cool the pecans in the pan and store them in a glass container with a lid. Use as a garnish for salads or ice cream. In a small bowl whisk together the olive oil, red wine vinegar, Dijon mustard, chopped green onion, salt, and pepper. Assemble the salad by mixing the lettuce, red onion and blueberries together in a large bowl. Toss with the vinaigrette. Top with the crumbled blue cheese and sugared pecans. So yummy and not at all boring!